This week’s material is, aluminum. Aluminum is a highly flexible and commonly used material for machining purposes. There are many great characteristics of aluminum that make it one of the more commonly used materials in manufacturing, across many different sectors of business. Aluminum is a relatively soft and light metal, making it a highly form-able and weldable material. Along with its ease of use, aluminum is also highly resistant to corrosion. These positive attributes aluminum possess are main reasons as to why aluminum is found through out all industries. Common places you will see aluminum being used vary from the food processing, marine applications, railroad, furniture bracketing, and outdoor construction projects. While there are many positives about aluminum, just like anything in life, there are some draw backs as well. Due to its soft nature, aluminum is not a great option when there will be a high amount of potential stress to the product. Aluminum also has a naturally high reflective rate, which can make laser cutting aluminum difficult and add extra wear to the laser cutter. 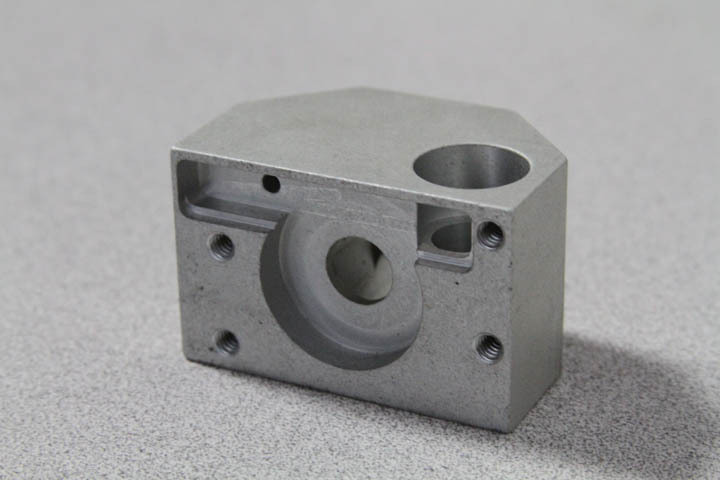 This is a finished 6061 aluminum part that was made with a CNC machining center. There are over thirty-five aluminum alloys that are used to manufacture parts, however, there are ten common alloys most used. You may find a list of the ten common alloys here. The alloy we find ourselves using the most is the 6061 alloy. The 6061 alloy is highly machinable, and keeps to form well when heat treated is necessary. 6061 is 97.9 % aluminum, while the rest is made up of 1% magnesium, .6% silicon, .25% copper, and .25% chromium. 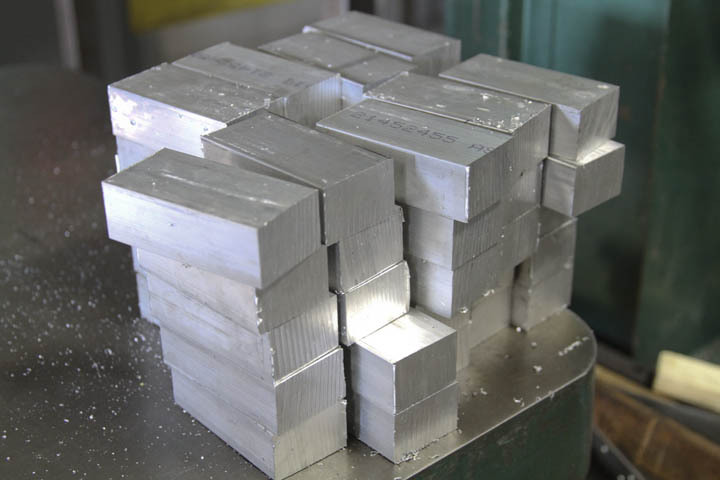 A stack of 6061 aluminum pieces ready to be machined. The information in this table was derived from, “Metals Handbook, 8th Edition” published by The American Society for Metals, pages 936-946. This entry was posted in Materials on January 15, 2014 by johnatmetalproducts.